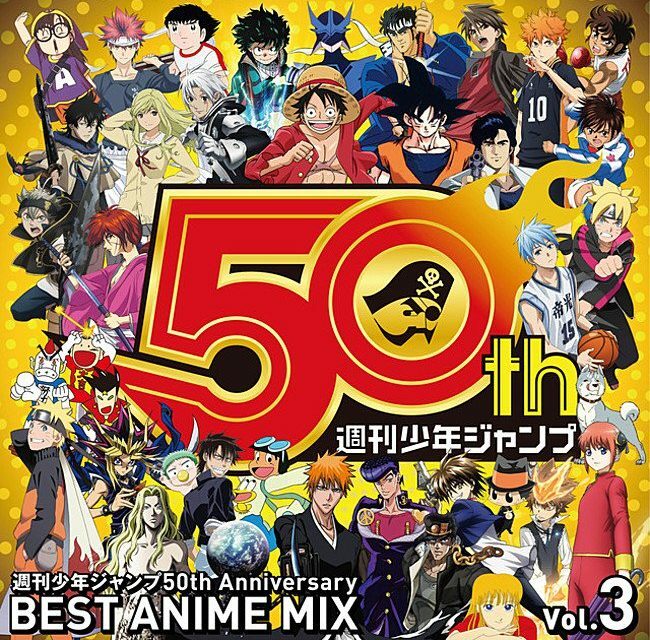 Shueisha ‘s Weekly Shonen Jump magazine is marking its 50th anniversary with a number of promotions and projects. The third part of a commemorative CD project, Weekly Shonen Jump 50th Anniversary BEST ANIME MIX vol.3 , will ship in Japan on July 4. The first CD in the magazine’s 50th anniversary series shipped on January 10, followed by the second on April 4. DJ Caesar has provided the mix for the all three CDs. Other celebrations for the magazine’s 50th anniversary include a music festival, a special Nintendo Classic Mini: Family Computer version, three-part art exhibition, reprintings of landmark issues, a manga contest, and T-shirts from UNIQLO .